I have the widget set to its default of 50km from my home location, yet it's showing events much further away, in one case 110km away. That's odd. I just checked and the limits are being applied correctly on my Dashboard. I even changed it a few times and it filtered out events appropriately. I wonder why it's only affecting some users. I seem to recall back when it was first introduced that they got the conversion from miles to kilometres reversed, so perhaps that bug has returned. My dashboard events for "within 100km from home" for 31st Dec show 12 events and "view 9 more". 2 of the 12 events are within 100km and 10 are between 108 and 232km. View 9 more gives only two which are the two within a 100km distance. This is the sort of mixed result I usually get from the events calendar. Using Windows 8.1 and Opera. Thank you for bringing this to our attention. I have documented the bug for further investigation. The top row shows: An event 14 miles away is shown when I have the widget set to 50 miles, but does not appear when the widget is set to 100 miles. It should appear in both settings. The bottom row shows: The error is inconsistent. An event 16 miles away is shown when I have the widget set to 50 miles and when the widget is set to 100 miles. This is correct behavior and very similar to the situation in the top row. It seems odd that the top row is 'broken', while the bottom row is not. I tried to reproduce this but failed to do so at this point. All works as expected on my end. I just realized that the 14 mile event that shows up at 50mi, but not at 100mi, has the new time fields populated - while the 16 mile event that shows up correctly at both 50 & 100 miles does not use the time fields. Not sure if that is related, although it still wouldn't explain why the problem isn't reproducible on your end. Will keep an eye out and report if I come across any other instances. I just realized that the 14 mile event that shows up at 50mi, but not at 100mi, has the new time fields populated - while the 16 mile event that shows up correctly at both 50 & 100 miles does not use the time fields. I ran some more tests specifically targeting what you described. If there are multiple events without Event times, they all display. 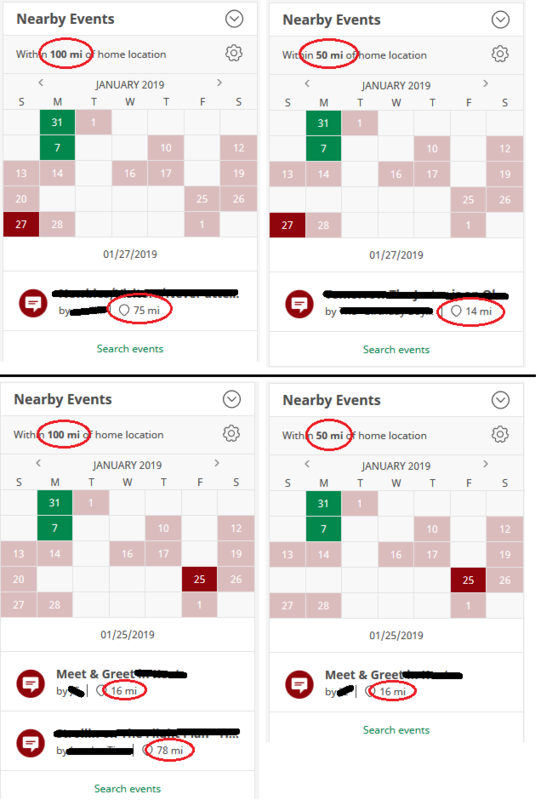 If there are multiple events and one of them has Event times, it does not display, but the ones without Event times do. This is not intended. We will report this bug to our engineering teams. Just curious if there was any ETA on this fix? Also wanted to point out another variation of the issue, where all of the Events have Event times. There are 2 events on 2/9 that are within 100 miles of my home coords - a regular Event is 13 miles away and a CITO is 7 miles away. The 7 miles CITO shows only when I have the widget at 10 miles - it doesn't appear in the widget when I use 20, 50, or 100 miles settings. The 13 miles Event correctly shows at 20, 50, and 100 miles - so that's good. 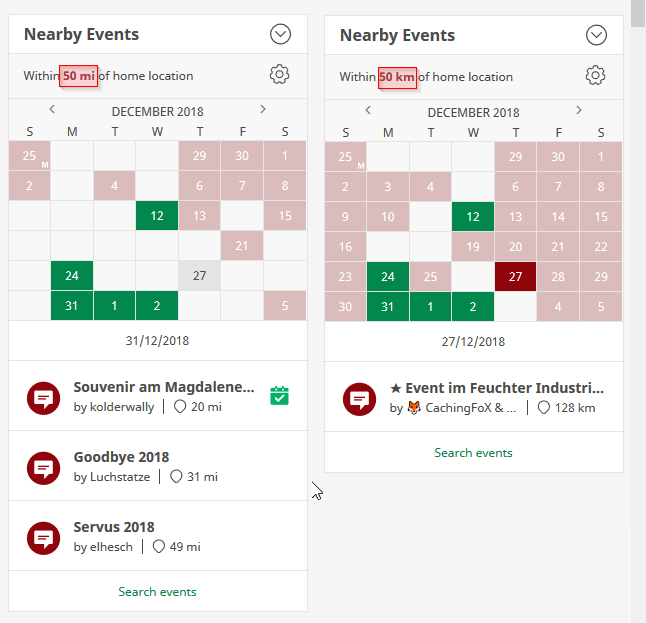 Both of these events have the correct event times in the cache page header. Seems like somebody used an inner join instead of an outer join, but what do I know? A fix for this just went live. All should be well now.